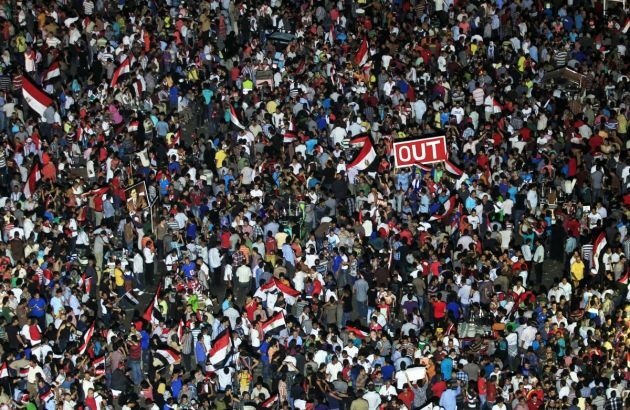 (Photo: REUTERS / Mohamed Abd El Ghany)Protesters opposing President Mohamed Mursi at Tahrir Square in Cairo June 30, 2013. UNITED NATIONS, April 28 (Reuters) - U.N. Secretary-General Ban Ki-moon expressed alarm on Monday at reports that an Egyptian court has issued a new mass death sentence to the leader of the outlawed Muslim Brotherhood and 682 supporters, the U.N. press office said in a statement. "The Secretary-General is alarmed by the news that another preliminary mass death sentence has been handed down today in Egypt, the first of which was on 24 March," the statement said. "Verdicts that clearly appear not to meet basic fair trial standards, particularly those which impose the death penalty, are likely to undermine prospects for long-term stability," the U.N. statement added. The Muslim Brotherhood, in a statement issued in London, described the ruling as chilling and said it would "continue to use all peaceful means to end military rule."